Covers the fundamentals of linear theory of finite elements, from both mathematical and physical points of view. Major focus is on error estimation and adaptive methods used to increase the reliability of results. Incorporates recent advances not covered by other books. 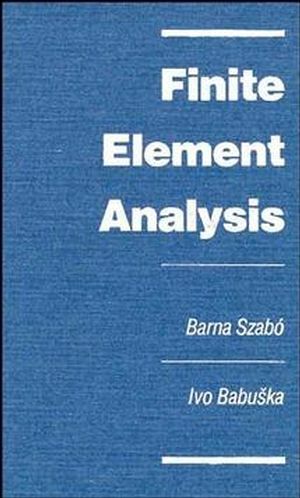 Barna Szabo and Ivo Babu?ka are the authors of Finite Element Analysis, published by Wiley. Mathematical Models and Engineering Decisions. Generalized Solutions Based on the Principle of Virtual Work. Finite Element Discretizations in One Dimension. Extensions and Their Convergence Rates in One Dimension. Element-Level Basis Functions in Two Dimensions. Computation of Stiffness Matrices and Load Vectors for TwoDimensional Elastostatic Problems. Assembly, Constraint Enforcement, and Solution. Extensions and Their Convergence Rates in Two Dimensions. Computation of Displacements, Stresses and Stress Resultants. Computation of the Coefficients of Asymptotic Expansions. Models for Plates and Shells. Estimation and Control of Errors of Discretization.